Overwatch players, it’s time to put your skills to the test. Game developer Blizzard Entertainment just announced that it’s upping the difficulty of its first-person shooter by adding a senior-citizen character who weakens their entire team by being a financial drain and emotional burden. If you’re a gamer who relishes a real challenge, get excited! 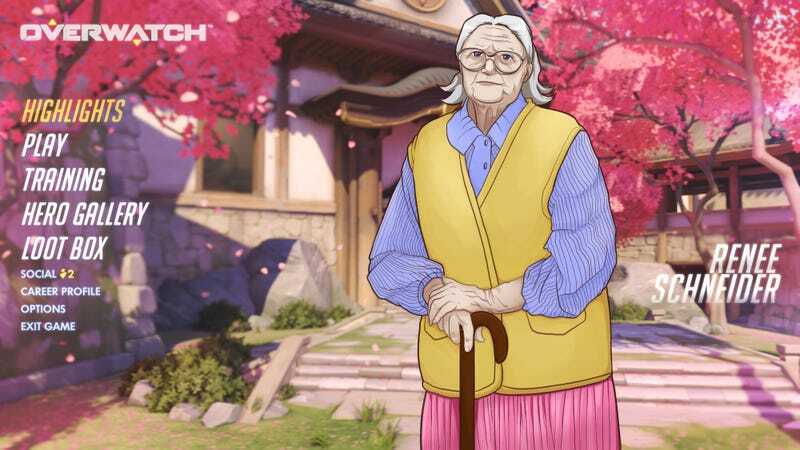 Renée’s backstory is explained in an awesome animated video, showing how the other members of Overwatch resent her presence in their lives but also feel obligated to look after Mrs. Schneider in her waning years. The video shows fellow heroes like the intelligent gorilla Winston and the robotic monk Zenyatta sitting in the old woman’s apartment watching Wheel Of Fortune with her, trying to figure out how to politely excuse themselves to go on a mission while Renée drones on about how her children and grandchildren never visit her and that it’s nice to not be alone for once. According to her stat sheet, Renée has a low movement speed and minimal hit points, requiring the player to continually pester their team for assistance doing simple tasks like fetching a box of bran flakes from a high shelf. Even normally agile characters like the time-hopping Tracer will be forced to operate at a much slower pace in order to help Renée with chores like applying arthritis cream to her swollen ankles and going to the bank. In combat scenarios, Renée promises to be an emotionally taxing presence, frequently uttering lines hinting that she led an interesting and inspirational life in her youth, traveling the world and getting a business degree in the 1950s, which makes her slow decline into her current feeble and sickly condition all the more depressing for the warriors of Overwatch to witness. For pro Overwatch players eyeing how Renée will change the competitive meta, they’ll certainly be impressed by her “anxiety aura” passive ability, which makes all other characters stressed out and tired just thinking about Renée, even when nobody is playing her at the moment, resulting in a 50 percent accuracy penalty to all attacks. And there’s no doubt that Renée is going to majorly change the dynamic of battles, especially when she uses her ultimate ability of needing life-saving heart surgery that costs $260,000, which the other heroes will have to pay for out of pocket, even though Renée is already very old and it kind of seems like a waste to spend all that money just to prolong her life by a few scant years but you’ve got to give her the money anyway because you’d look like a monster if you just let her keep suffering. Wow! Sounds like Blizzard is making a great game even better. We can’t wait to play!